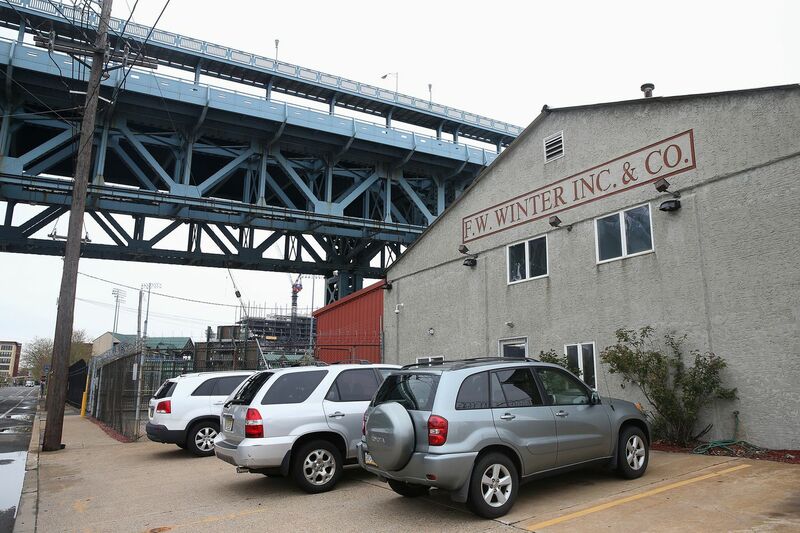 For the second time, a South Jersey company that wants to erect a billboard at the base of the Ben Franklin Bridge in Camden has asked the city to delay a hearing on the controversial proposal. Interstate Outdoor Advertising, based in Cherry Hill, asked the city to postpone a hearing Monday before the zoning board seeking a variance, said CEO Drew Katz. A reason for the delay was not provided. Drew Katz says he wanted to honor the legacy of his father, Lewis Katz by setting up a funding source for non-profits in Camden. "We are not going forward today," Katz said in a text message, declining additional comment. "I have nothing to add right now." With opposition mounting, the latest delay cast doubt over the proposal to build a 167-foot-high billboard in North Camden near the Delaware River waterfront. A new hearing was scheduled for Sept. 10, said city spokesman Vince Basara. Liberty Property Trust, which is spearheading a $800 million project underway to remake the Camden waterfront, has concerns that the billboard would hamper economic development in the area and mar the Philadelphia skyline, said John Gattuso, senior vice president of the developer. "The City of Camden has worked very hard … to really move forward and reinvent itself as a place that is a compelling environment for people to work, live and be entertained," Gattuso said. "I don't think that kind of billboard is keeping with that kind of environment." Cooper's Ferry Partnership, which is overseeing redevelopment in Camden, also has misgivings about the proposal, said Kris Kolluri, chief executive officer. "It certainly doesn't sound like it's the right location for a billboard," Kolluri said in an interview Monday. "I know others have expressed the same concerns." Until now, the plan, announced by Katz in April, has mostly come under attack from residents and community groups who say the billboard would drastically change the architectural landscape of the area and create an eyesore for commuters, bridge runners and walkers, and residents who live nearby in North Camden and the Cooper Grant neighborhood. Under the proposal, messages on its two digital screens would target thousands of commuters who travel across the bridge daily from New Jersey into Philadelphia. It would cost about $800,000 and take about six months to build, Katz has said. In what is believed to be the first venture of its kind in the country, proceeds from advertising sales, about $200,000 annually, earmarked for nonprofits in the city. Katz said the billboard would be used to create a permanent funding source for charitable groups. Katz, the son of Lewis Katz, a Camden native and philanthropist who gave millions to his hometown, said he came up with the billboard proposal as a way to carry on his father's legacy. The elder Katz, a co-owner of the Philadelphia Media Group, publisher of the Inquirer and Daily News, died in a plane crash in May 2014. But the company needs a zoning variance from the city to proceed with the proposal. The redevelopment plan for the parcel of land at Elm Street and Delaware Avenue where the billboard would be placed prohibits billboards. In late April, Katz asked the city to delay a May hearing with the zoning board and said additional meetings would be held with community groups and residents to allay concerns about the billboard. The company has obtained a state permit for the project and reached an agreement with F.W. Winter Inc., a metal and alloy manufacturer that owns the land where the billboard would be built, he said. It was unclear why Interstate has now requested a three-month delay. The zoning board has meetings scheduled in July and August. Edward Williams, the city's planning director and zoning officer, did not respond to a telephone message. The Camden Lutheran Housing Inc., a nonprofit in North Camden, has not been contacted by Interstate, said Betsy Clifford, executive director. The group has gathered hundreds of signatures on a petition opposing the billboard proposal, she said. "Our position has not changed," Clifford said. "We do not want the billboard in North Camden." The Cooper Grant Neighborhood Association, which met with Interstate officials in May, voted unanimously to oppose the proposal, according to resident Benjamin Saracco. Under the proposal, nonprofits would be eligible to apply for grants from a nonprofit board that would be created to disburse revenues generated from billboard ads, Katz said. "Our motivations are only pure here," Katz said previously.